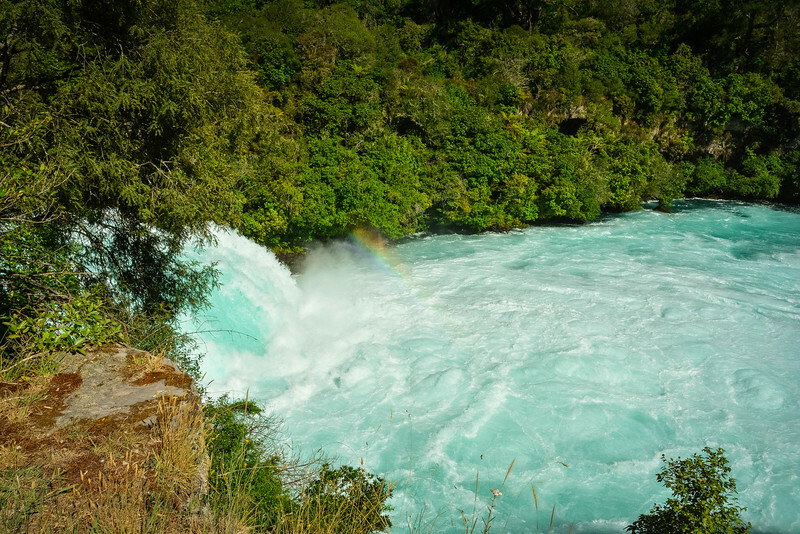 Huka Falls - Why You Need to Visit This Natural Attraction? Home New Zealand Huka Falls – Why You Need to Visit This Natural Attraction? New Zealand is blessed with having a myriad of amazing natural attractions scattered across both islands. 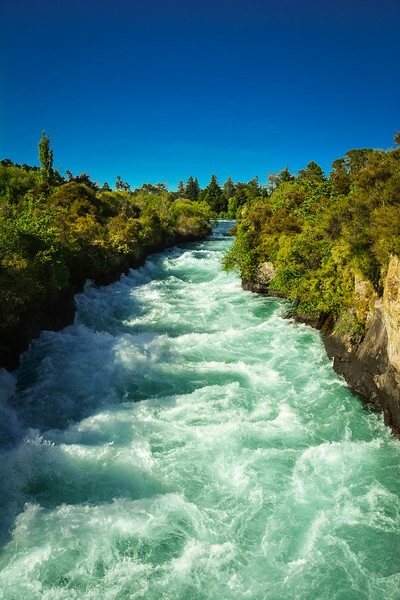 Although we only spent a short amount of time exploring the North Island, we stumbled across many of these breathtaking natural phenomena including Huka Falls located in the heart of the island. If you are not familiar with this raging waterfall, we are confident that after seeing our experience, you will be ready to book a trip to New Zealand just for this attraction alone. Having spent an amazing week traveling around the North Island, our final day in New Zealand arrived with us both feeling a little disappointed that our time here was coming to an end. 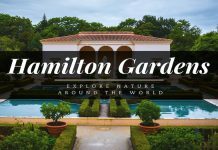 We wanted to finish with an amazing experience and decided to take the drive from Hamilton where we had stayed the night before to the Lake Taupo region. I think it’s fair to say the day turned out way better than we could have ever imagined! 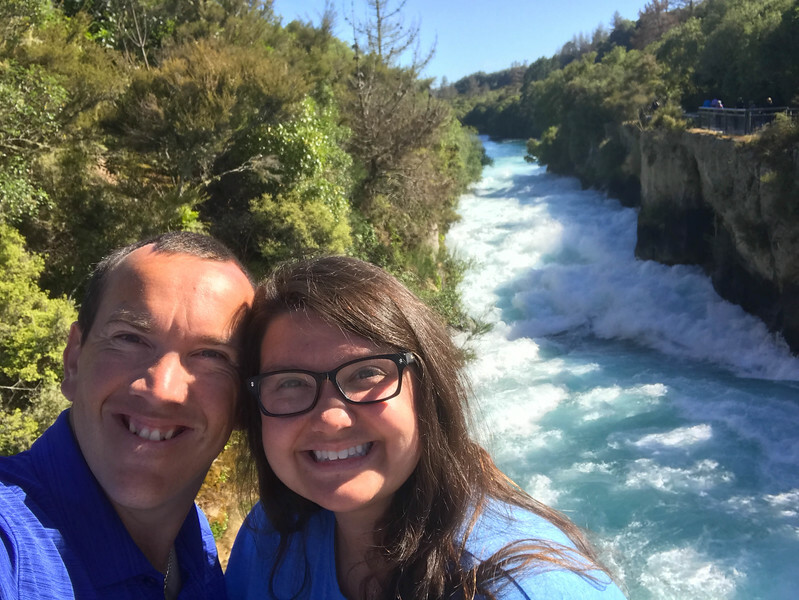 Let’s take a look at why Huka Falls immediately caught our attention and provided ample entertainment for our time at this spectacular location. It will be no surprise to find out that this is New Zealand’s most visited natural attraction! 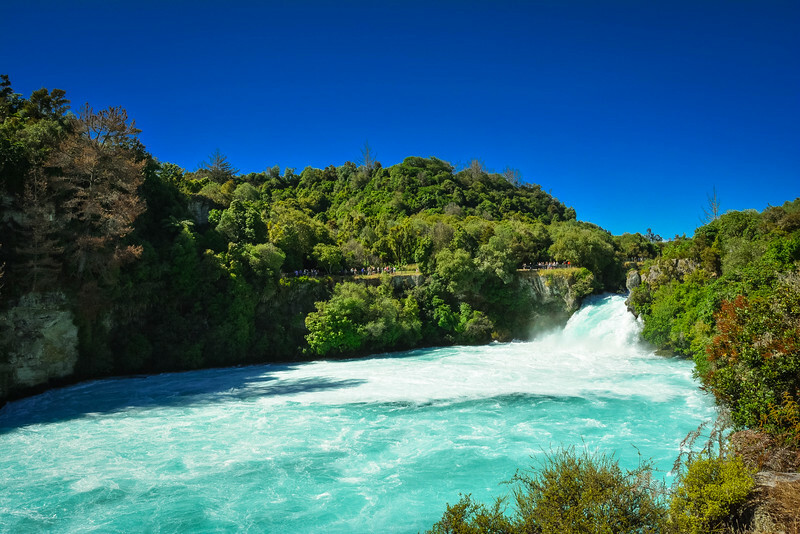 Huka Falls are a set of gorgeous waterfalls on the Waikato River connected to Lake Taupo which is just a few miles from this landmark. It may not have the height of some of the world’s most iconic waterfalls but what it doesn’t have in height, it certainly makes up for with power and beauty. Located inside the Wairakei Tourist Park, it is just a five-minute drive from the town of Taupo and is also easily reached from a number of locations around the North Island. 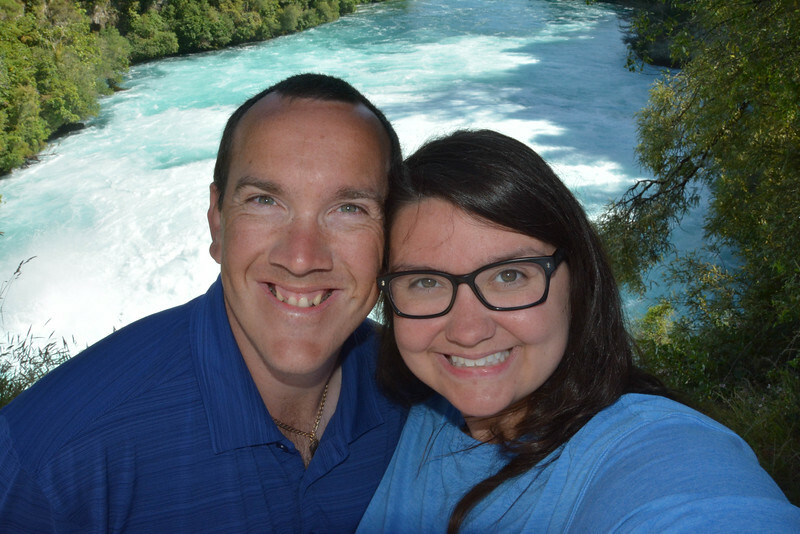 After spending some time at Huka Falls, we headed to the town center of Taupo to explore the lake and downtown area. We noticed that you can actually walk/bike all the way from Taupo to Huka Falls along the banks of the river via Spa Thermal Park and this would certainly be a really cool adventure if time permitted. 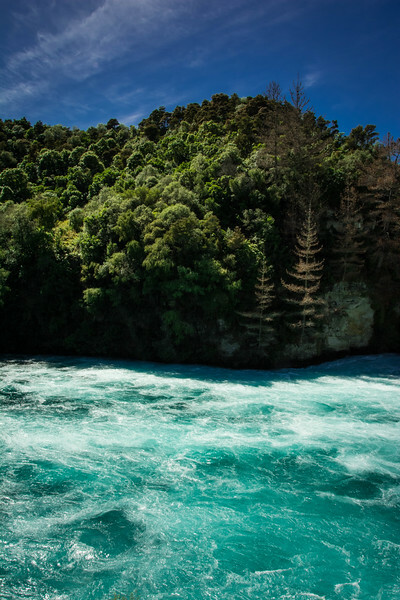 Did you know that the word “Huka” is a Maori term for “foam”? It’s quite appropriate that these falls are referred to as “Foam Falls” given the amount that is created every second the water flows over the edge. 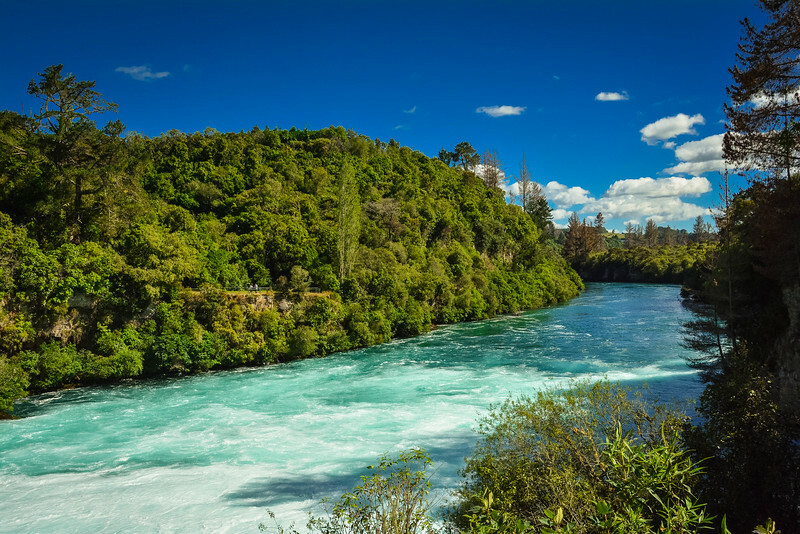 You may also be interested to know that Huka Falls was created because of the narrowing of the Waikato River. 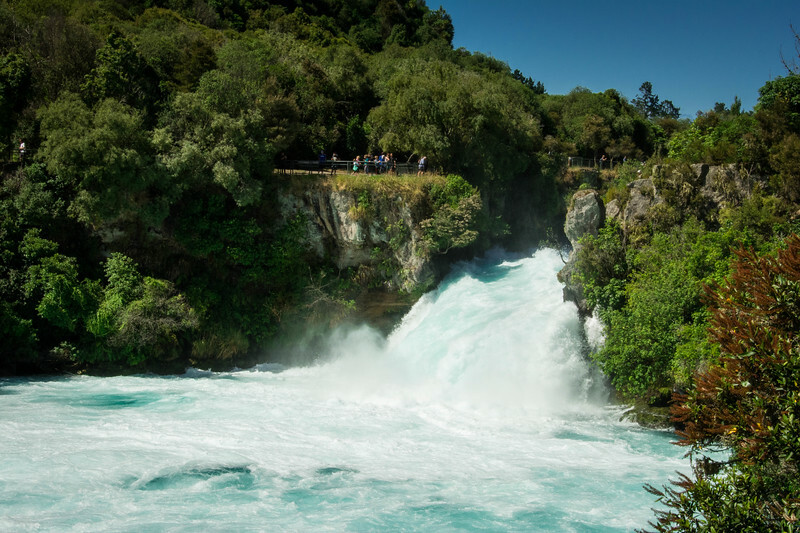 For much of the river’s length, it is approximately 100 meters wide but it abruptly narrows as it approaches Huka Falls creating a powerful surge as the water scrambles to get through the narrow gap. Approximately 26,000 years ago, the narrowing of the Waikato canyon was created when the Oruanui eruption of Taupo Volcano took place. 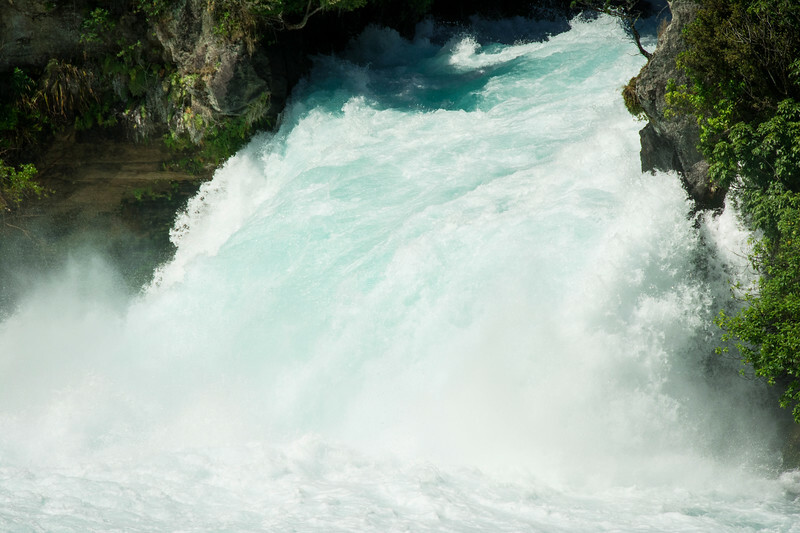 Renowned as one of New Zealand’s largest volcanic eruptions, this helped shape the gorge we see today and certainly we can thank this devastating phenomenon for creating Huka Falls. HERE YOU WILL SEE ONE OF THE GREAT NATURAL WONDERS OF THE WORLD IN ACTION! 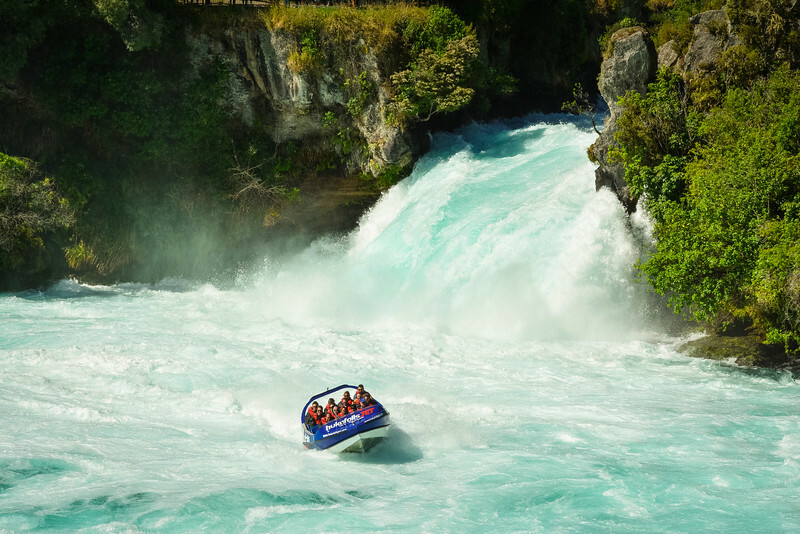 Did I mention you can actually hop on board a high-powered jet boat and cruise right up to the base of the majestic Huka Falls? Unfortunately, we didn’t have time to wait for the next available jet boat so we had to enjoy the view of the jet boat from the various overlooks at Huka Falls. Don’t worry, you won’t be disappointed and although I’m convinced nothing can match the actual experience onboard the boat, it’s a pretty good alternative to just sit back and watch. We strongly recommend booking this experience ahead of time if you really want to don your adventure junkie hat and prepare for the experience of a lifetime. This is the ultimate thrill a minute ride and just watching these folks was enough to send chills down my spine. 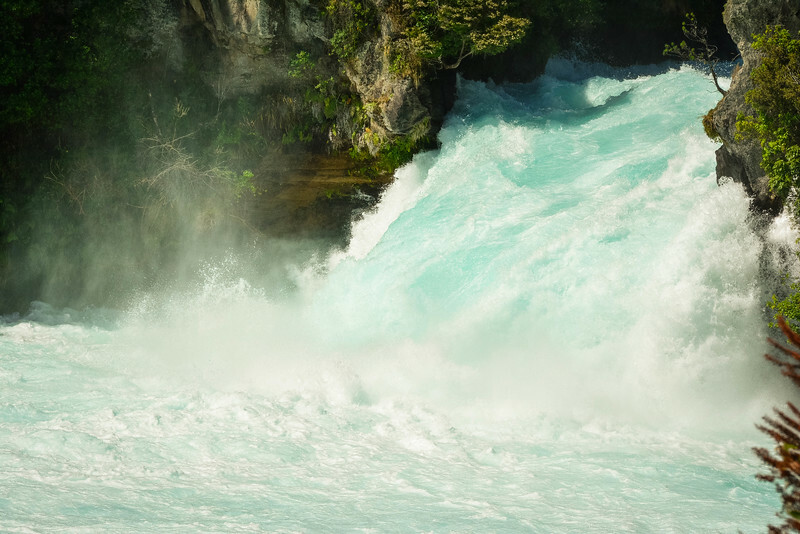 The large volume of water flowing over the falls amounts to approximately 220,000 liters per second so imagine taking a jet boat to the base of these falls and feeling the force of the water. The guides driving the jet boats are certainly experienced to know exactly where to go and how to handle this power. 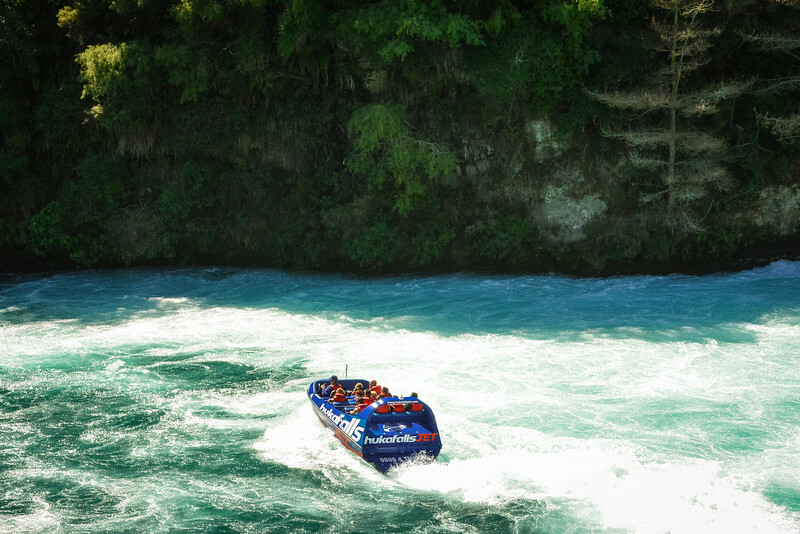 Tickets for the Huka Falls Jet Boat are NZD 125 for adults ($90) and NZD 79 for children under 15. The experience lasts 30 minutes and for only NZD 19 you can have an “instant replay” and do it all over again. 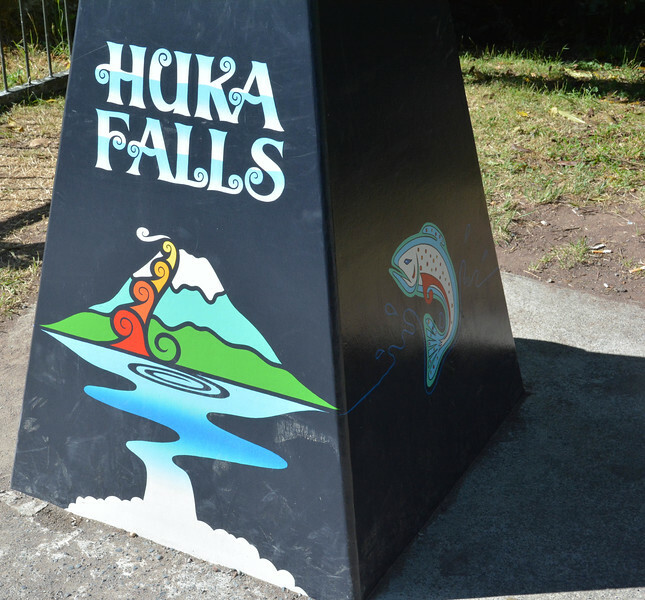 Get ready to put on your favorite hiking boots and explore the amazing trails and overlooks at Huka Falls. Regardless of your hiking skills, there is something here for everyone with trails ranging from 5 minutes to 2 hours in length. We took a couple of the shorter trails to find the perfect vantage points to admire the breathtaking sight of the cascading waterfalls. As we crossed the bridge that connects both sides of the Waikato River, we caught our first glimpse of Huka Falls. There is seriously A LOT of power in the water that is rushing through this gorge and over the edge of the falls. 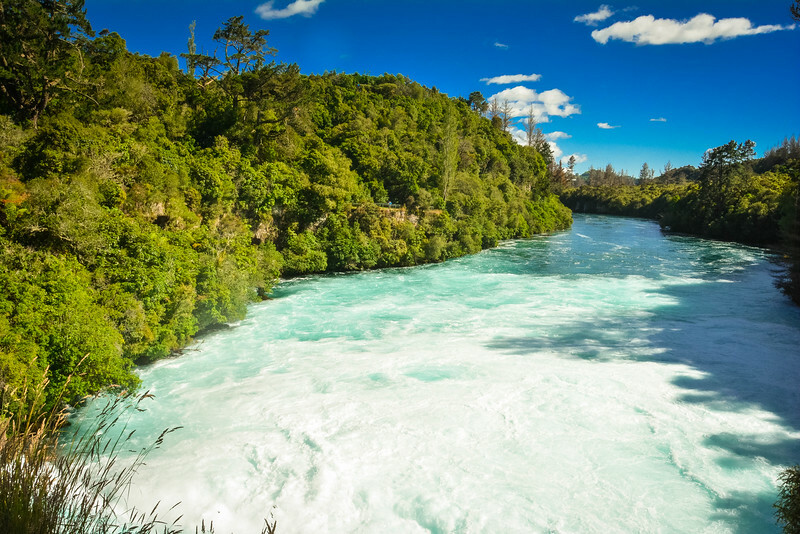 Another noticeable aspect of Huka Falls is the color of the water. The crystal blue color of the water combined with the vibrant white of the cascading falls and the surrounding terrain create a picture-perfect landscape for avid photographers. Every overlook provides a slightly different angle to capture that perfect shot and trust me when I say, there are plenty of perfect moments to be found here! 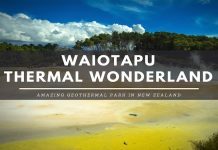 There is a two-hour trail that will wind you through scenic surroundings until you arrive at the Aratiatia Dam, another awesome attraction worth visiting if you are in the Taupo area. 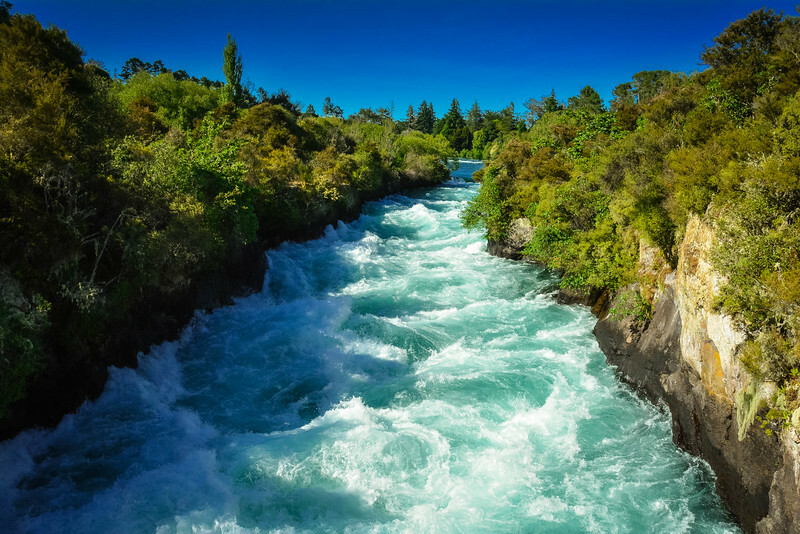 We didn’t have enough time to walk this whole trail but we did take another short hike to gain a better view of Huka Falls from a distance and again enjoy another rendition of the jet boat cruising through the waves to the base of the waterfall. We have been fortunate to visit a number of gorgeous waterfalls around the world including Niagara Falls but there was something quite spectacular about Huka Falls that immediately got us “hooked.” It may sound a little cheesy to say that we were “hooked by Huka Falls” but sometimes it’s just appropriate to coin a phrase that actually applies and that’s definitely the case here. 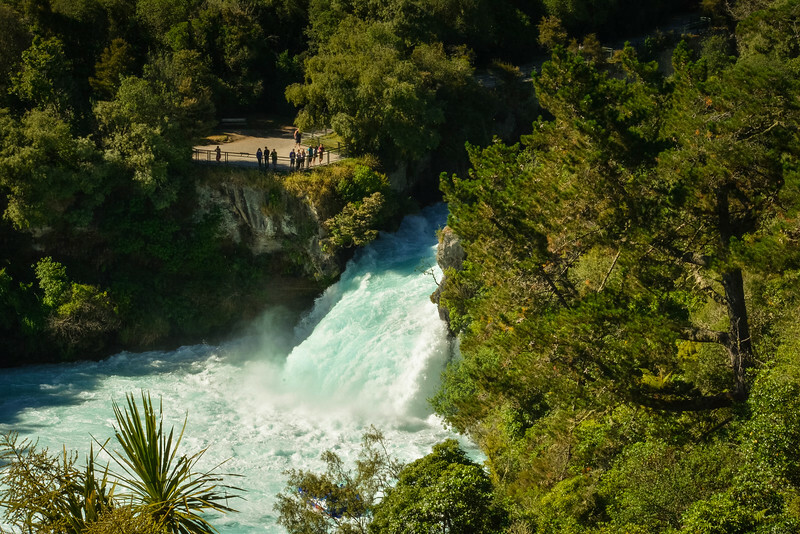 During our next visit to New Zealand, we will make sure that we have more time to explore Huka Falls and the surrounding area so that we can enjoy all of the gorgeous hiking trails. 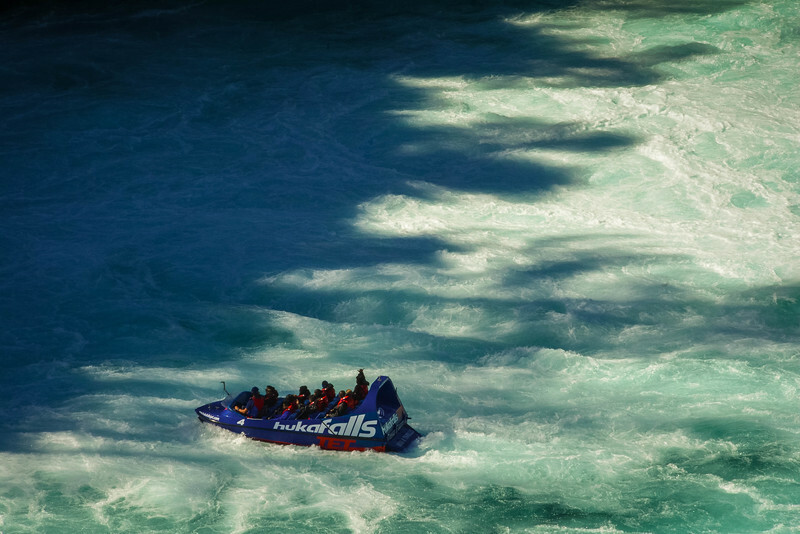 One final recommendation, don’t visit Huka Falls without booking a trip on board the jet boat! This is 100% top of our bucket list for our next visit to this part of the North Island. Previous articleGreat Ocean Road Day Trip – Is It Worth the Time and Money? Next articlePearl Harbor Memorial Tour – Why Is It the Best Attraction? Wow, this looks incredible! New Zealand is definitely on my list of places to go (it’s a looong list!) The color is amazing and it almost seems more dramatic because it is shorter than other touristy falls. Very cool! Huka Falls really is incredible! That’s a great way to describe it. We could easily have spent all day here exploring different angles of the falls and just admiring the beauty and power of the water crashing over the edge. Wow! These photos of the falls are GORGEOUS and they make me want to go there right now. I’ve been to Niagra Falls too (albeit when I was younger), but the photos from these falls look much more spectacular, especially the blue sea-foamy color of the water. Thanks for the great information and photos. Hopefully I’ll be able to make it out to New Zealand one of these days to visit this. Thanks so much for your kind comments Hayley, we really appreciate it! 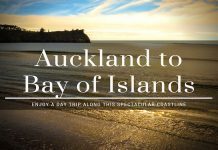 We waited a long time to visit New Zealand and this is just one of many amazing attractions that made our visit worthwhile. We are already looking forward to returning to spend more time there… it really is that spectacular! We have been fortunate to experience Niagara Falls also and admittedly it’s breathtaking but I think because it’s so popular, it’s hard to appreciate it as much as somewhere like Huka Falls. I really enjoy your posts. The pictures are superb, your information is very interesting. Excellent place for boating. I know that Newzealand and Australia have lots of natural beauty spots to explore. 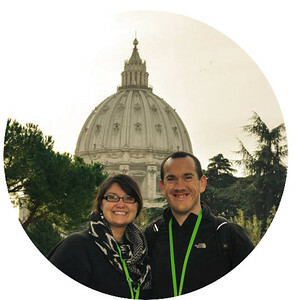 Your posts gave me detailed knowledge on those destinations. Thank you very much for the writings.